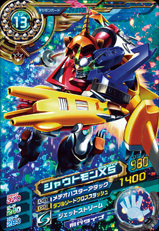 The "Finalist Mode", born when the hearts of five Digimon came together. It is a form of the "Victory Mode", who primarily specializes in ground battles, that obtained the power of flight as the ultimate power-up. 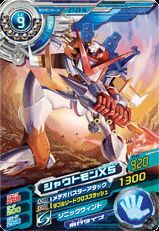 Its "Meteor Buster Attack", in which it runs up to the stratosphere, then becomes a meteorite and rams into the opponent, carves out a giant crater in not just the opponent, but also in the land around them for several hundred meters. Also, its "Meteor Impact", in which it concentrates all of its energy into its arm, then releases it as it rams into the opponent from close range, is a Special Move that reliably brings down the opponent. 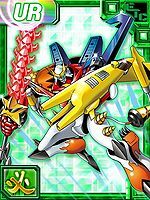 The DigiXros of Shoutmon X4 and Sparrowmon! 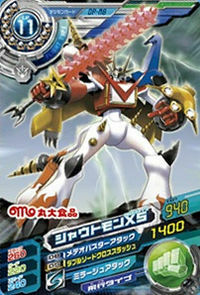 The "Finalist Mode", born when the hearts of five Digimon came together. 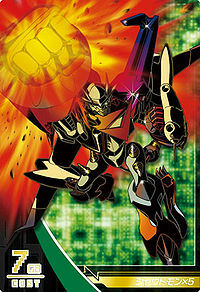 The "Victory Mode", who primarily specializes in ground battles, obtained the power of flight as the ultimate power-up! 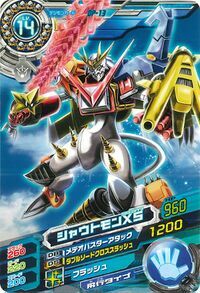 It attacks by running up to the stratosphere and becoming a meteorite, then ramming into the opponent (Meteor Buster Attack), and concentrating all of its energy into its right arm, then driving it into the opponent from close range (Meteor Impact)! 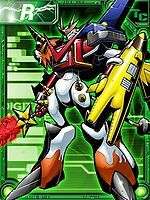 n., The DigiXros evolution technique, and the number of Digimon comprising Shoutmon X5. 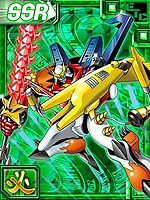 Anime/Manga Digimon Xros Wars: "Miraculous Digi Xros! 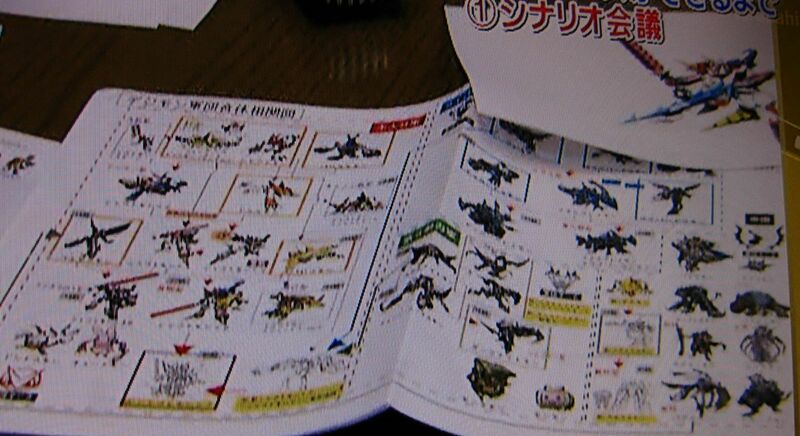 Shoutmon X5 Flies!" 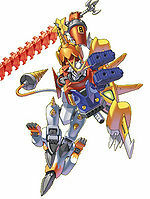 Shoutmon, Ballistamon, Dorulumon, the Starmons, and Sparrowmon are members of Xros Heart. Appears in the second special chapter of the manga. 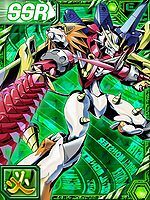 Shoutmon X5 is only obtainable as a collectible card. 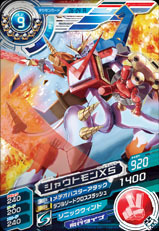 Its card is part of the Shoutmon Evolution (シャウトモン進化 Shautomon Shinka) set. This 'Finalist Mode' has attained the ability of flight! 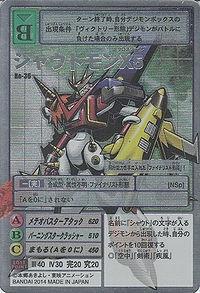 When Shoutmon X4 Digi Xrosed with Sparrowmon, who is able to fly freely in the sky, it acquired flight abilities. 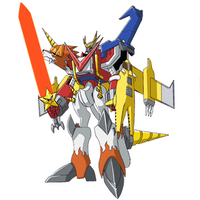 Shoutmon X4 and Sparrowmon Digi Xrosed to give birth to this Digimon specializing in flight abilities. "Meteor Buster Attack" is its Special Move, in which it tackles the opponent from the skies at a tremendous speed like that of a meteor. X4, which specialized in ground battles, has now acquired flight and shooting abilities, causing its battle prowess to soar. Its Meteor Buster Attack, where it turns itself into a meteorite and tackles the opponent, is powerful enough to create a massive crater in the surrounding ground. 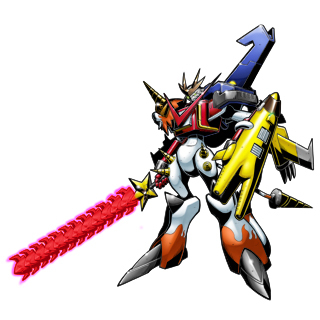 Its flight ability allows it to run up to the stratosphere in one go, where it launches an attack with enough destructive power to kill in one hit. A Digimon with the alias 'Ruler of the Skies', born from the DigiXros between Shoutmon X4 and Sparrowmon. 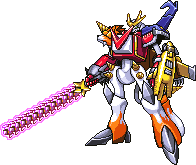 The strong thoughts of "I want to rescue Nene" caused a miracle to occur, and Shoutmon X5 was born through a new Digi Xros. The "Finalist Mode", formed by adding Sparrowmon's power to the four that made up "Victory Mode". It is now able to utilize its powers even in the air, after acquiring Sparrowmon's flight abilities. 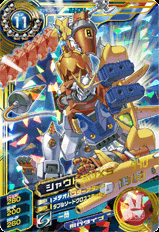 ↑ Digimon Xros Wars: "Miraculous Digi Xros! 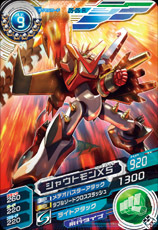 Shoutmon X5, Fly!" 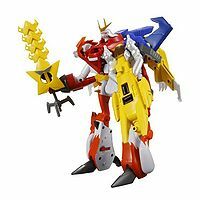 ↑ Digimon Xros Wars: "Wisemon, The Secret of the Digital World!" 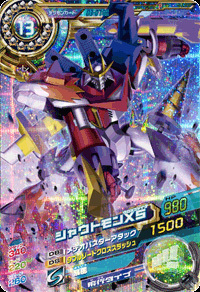 ↑ Super Digica Taisen: "Third Act DigiXros Units"
↑ Super Digica Taisen: "Fifth Act DigiXros Units"
↑ 10.0 10.1 Super Digica Taisen: "Sixth Act DigiXros Units"